Shred the ingredients finely: whether it is the green (nitrogen rich) or brown (carbon rich) components of your compost, shredding them finely using a shredder, a mower or even the gardening shears, can make the compost mature faster. Fine shredding increases the surface area of the ingredients involved thus giving ample scope for the microbes to decompose the materials faster. 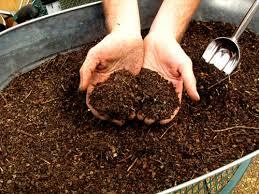 Right balance of green and brown: bacteria in the compost need both carbon and nitrogen to decompose effectively. For every one unit of nitrogen used by the bacteria they also consume about 30 units of carbon. If the C:N ratio is not adequate, the compost will take longer to decompose and will require more effort in terms of frequent turning and layering over again. 1/3rd greens to 2/3rd browns is the optimal balance as nitrogen rich items take less time to decompose. Compost temperature and Insulation: this has to be maintained between 55-65 degrees Celsius. The material in the centre of the pile should be warmer and darker than the outer edges to signify that the temperature is correct. Place a plastic sheet over the pile to trap the heat generated inside the pile. Specifics of making the compost pile: The compost pile has to be atleast 1.5m high and needs to be turned more frequently to let in more air. It must be turned from outside to inside and vice versa to mix it thoroughly. First 4 days, do not turn the mixture to allow the heat to build up and then turn every second day for 14 days. You will get a soil-like fine, black potent compost of same volume as original ingredients if everything is well-followed. Also adding an activator in the new compost pile like old compost or manure can set the cycle rolling faster. Moisture: keeping the heap well moistened like a wrung sponge will ensure that the aerobic microbes multiply in the heap and don’t allow the stink-causing anaerobic ones to grow. Excessively wet compost heaps need to be drained. Keeping the four factors in mind- aeration, moisture, right component mix and insulation- you can speed up your compost-making procedure and get startlingly effective results.